Another "Are You Being Served?" actor has died. 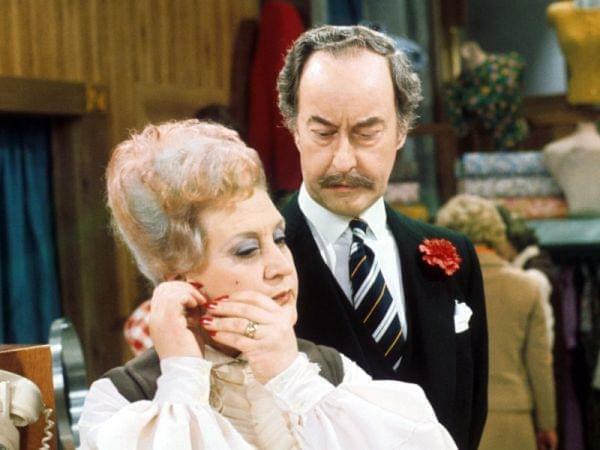 Mollie Sugden as Mrs. Slocombe and Frank Thornton as Captain Peacock in "Are You Being Served?" While Frank Thornton spent many years gamboling in and around Holmfirth as Truly in Last of the Summer Wine, he is perhaps best known to most WILL-TV viewers as stuffy Captain Peacock in Are You Being Served? and its sequel Grace & Favour (aka Are You Being Served? Again!). According to a BBC News report, Thornton died peacefully in his sleep at his London home. He isis survived by Beryl, his wife of 67 years, their daughter Jane and three grandchildren. Thornton's passing means that the sole remaining main cast member from Are You Being Served? is actor Nicholas Smith, who portrayed Mr. Rumbold. Smith, who turned 79 earlier this month, visited WILL-TV in September 2009.